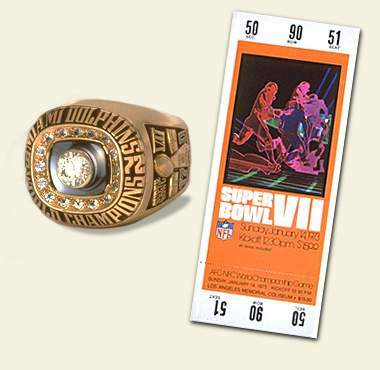 Following the 1971 NFL season, the Miami Dolphins made their first appearance in a Super Bowl (VI). The young Dolphins had posted a 10-3-1 record in the franchise's sixth year of existence, and Don Shula's second year with the team. Following a humiliating 24-3 loss to the Dallas Cowboys in the Super Bowl, many wondered how the players and coaches would bounce back in 1972. No one expected what the young team accomplished in 1972. A promising campaign seemingly was lost when starting quarterback Bob Griese went down with a broken leg during just the fifth game of the season. However, the Dolphins rallied behind journeyman Earl Morrall and posted an unprecedented 17-0 record, culminated by a 14-7 victory, Griese's first full game back, over the Washington Redskins in Super Bowl VII. How the Dolphins accomplished perfection is no secret. Shula relied on a smash-mouth power running game, featuring an amazing trio of Larry Csonka, Jim Kiick, and Mercury Morris, and the aptly tabbed "No-Name" defense to acheive what no NFL team had ever done: an unbeaten, untied season resulting in the world championship. Many would argue that the 1972 Dolphins are the best sports team ever; proponents would certainly point to the unblemished record to back that up statistically. As Csonka once said, "Perfection ends a lot of arguments." There may come a time when another team goes undefeated and wins the Super Bowl -- when that happens, I know their fans will take as much pride in that accomplishment as Dolphins fans take in the 1972 season. As the 2007 New England Patriots marched towards an undefeated regular season, I began to receive a lot of emails from people wanting to question the 1972 Dolphins' place in history. Many asked if I honestly thought the 1972 Dolphins could beat other Super Bowl championship teams or the 2007 Patriots. While it's fun to speculate, the fact of the matter is that we will never know how teams from different eras would fare in a head-to-head matchup against each other. Any speculation in that regard would be unfair to teams from eras where the players were much different physically. Some argue that the league was mediocre then, and that the Dolphins played an easy schedule. However, the NFL has had mediocre seasons before and after 1972, and other good teams have played easy schedules. But the fact of the matter is that, as of December 2007, no other teams has run the table and won the Super Bowl. I think the 1972 Dolphins deserve credit and respect for that remarkable accomplishment. So far, six players from the '72 Dolphins team are enshrined in Pro Football's Hall of Fame: Nick Buoniconti, Larry Csonka, Bob Griese, Jim Langer, Larry Little, and Paul Warfield. In July 1997, Head Coach Don Shula joined them in immortality in Canton, Ohio. This web page is my personal tribute to those Dolphins. I have been a Dolphin fan since 1980, when my family moved back to the US from overseas, and although I never got to see the 1972 Dolphins in action, they will always hold a special place in my heart. Even though 35 years have passed since that magical season, just the mere mention of "1972" evokes pride in Dolphin fans everywhere. So, welcome to one fan's tribute to the 1972 Miami Dolphins. Take a look around, enjoy your stay, and drop me a line with any comments! Tribute to the 1972 Miami Dolphins Web Pages created by James Benson. These pages and this site is in no way affiliated with the Miami Dolphins or the National Football League. This is a personal creation to honor the undefeated 1972 Miami Dolphins. Any concerns should be addressed to me, not to the Miami Dolphins or the NFL. Thanks.